Blocks and construction elements are great toys when it comes to open ended play. By far, the most famous and familiar brand of brick toys is Lego. Lego comes with a tremendous large variety of building blocks, in different shapes, sizes and colors. It is a captivating toy for toddlers, kids and grown ups, regardless their gender. Your infant can start playing safely with Lego from age 1½. Yes, with Lego Duplo, your child will be able to explore the world of Lego from an early age and this is a good thing in so many ways: it develops creativity, inventivity and imagination, but it also helps language and learning by playing. 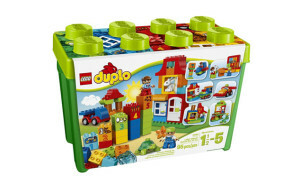 Lego Duplo games are composed of larger blocks than the classic ones to prevent the possibility of being swallowed. The bricks are colorful, so your infant can learn the colours while he plays, and your toddler can build a large variety of objects, like cars, trains, cute animals, castles, towns (structured block play, using a manual) or whatever their imagination tells them. There are Lego Duplo packs created specifically for boys (for example My First Number Train Building Set), or for girls (like All-in-One Pink Box of Fun) and, of course, there are also gender-neutral packs (ex. Creative Animals, or My First Playhouse). The fun part is that all the packs can be combined and your toddler can create a large town to play in with different figurines. He can use base plates to fix all the elements together. Then, he can create a multitude of stories only limited by his imagination. A really awesome fact is that, even though Lego Duplo pieces are eight times the size of regular bricks, they connect perfectly with the regular ones, so the possibilities to expand are even greater. Lego is a must-have toy in every toddler or kid’s playground. It gives the child the chance to build without structure, mistakes or predefined goals. It is a great means for open-ended play that does not impose to children a certain pace or method. 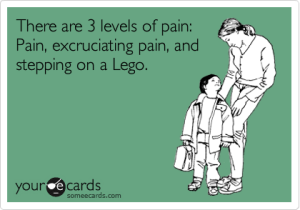 Lego develops flexible and innovative thinking, imagination and creativity, as well as independent playing. Do Lego games have a bad part? Yes.. you’ll probably want to watch your steps carefully around the house.